Time sure flies when you're having fun developing innovative SEO and digital marketing tools. 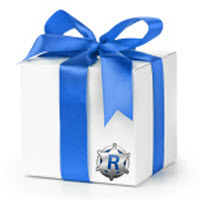 While it's hard to believe that another year has come and gone, it's not hard to believe how many new tools, reports, and integrations we've loaded into Rank Ranger this past year! We even redesigned the Rank Ranger site! Our mission was to make 2017 unique, so we set off on an adventure to create new tools and reports that would give you additional insight and enlightenment. Along the way we threw in a serious set of new integrations so that you could create a fresh set of custom comparisons. Of all the years we've been bringing you the best in SEO and digital marketing reporting, 2017 was by far the most fun! Before we go through all of the fantastic updates we've made to our software this year, we just have to share our new site design with you! Just a few weeks ago we released the latest incarnation of the Rank Ranger website, and it's been the buzz of the office ever since! 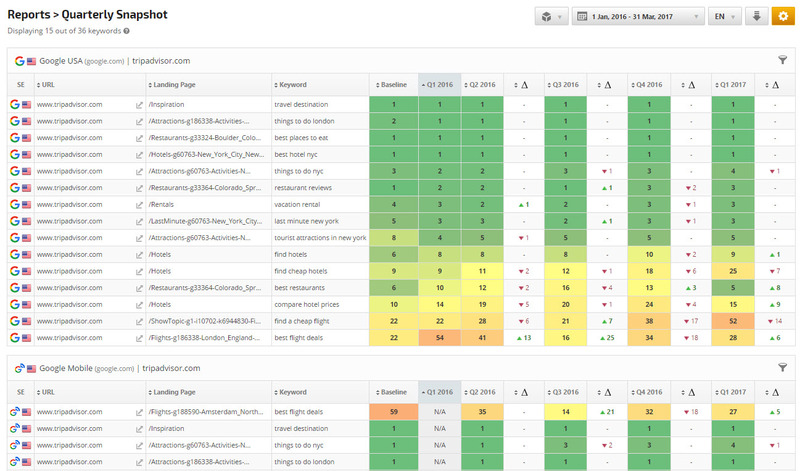 Along with the redesign, we've introduced the Custom SEO Suite. After years of producing an abundance of custom SEO and marketing reports and dashboards, and after long offering numerous custom development and pricing options, we thought it was high time we put it all under one roof! We've added a nice new set of SEO and marketing tools to our repertoire in 2017. Nice isn't really the word. In 2017 we released tools designed to shred, devour, and dominate (or any other really cool sounding adjective) the competition. In all seriousness, we carefully crafted a set of tools to help you understand and level the competitive playing field, even when your top competitor is yourself! 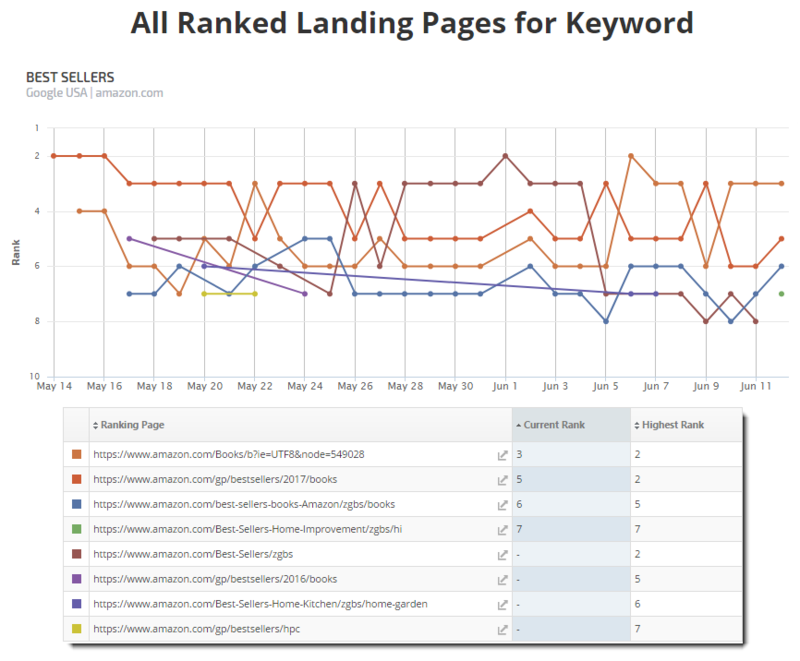 First out of the gate is a tool we're particularly proud of, the SEO Monitor. 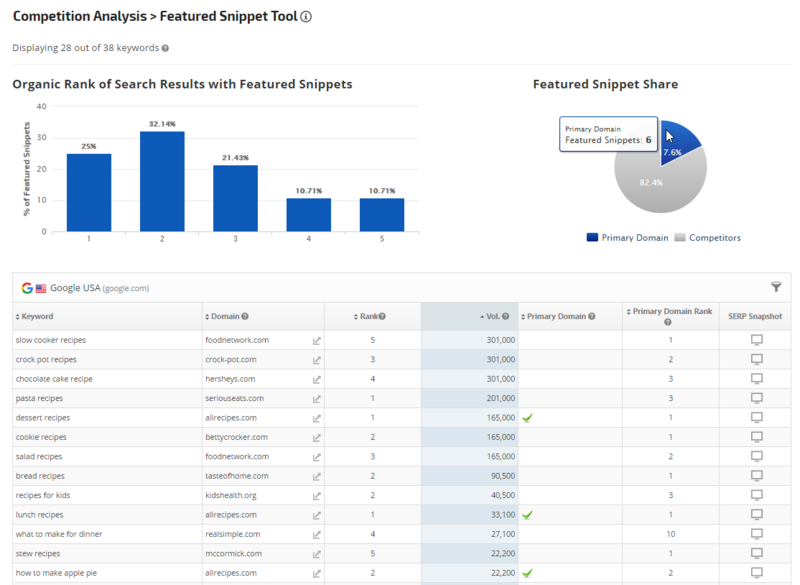 Unprecedented, the tool not only allows you to discover your top competitors for a keyword, but also helps you track their every move. 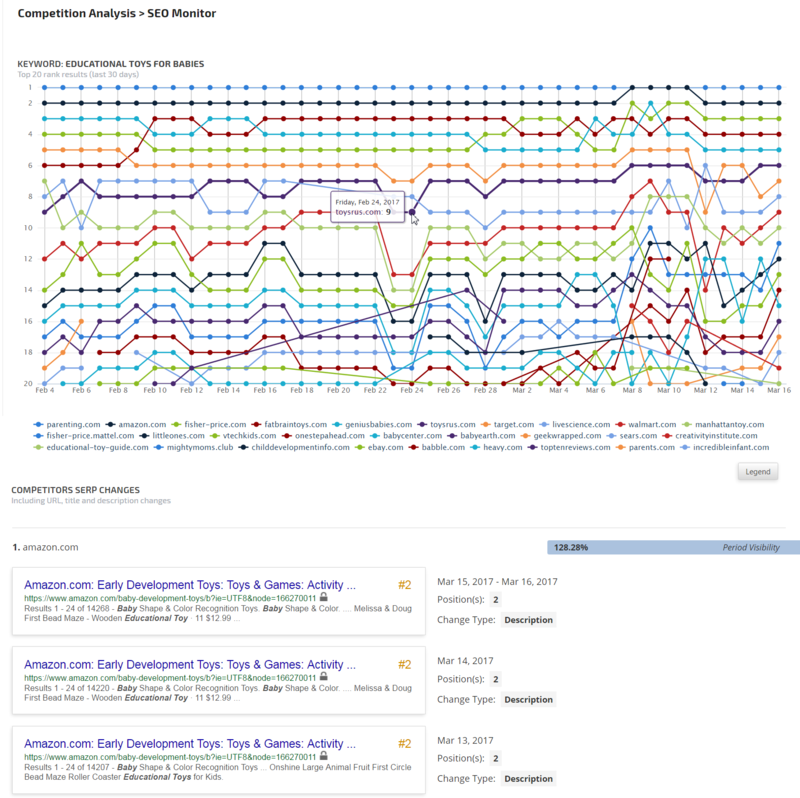 The tool starts your journey towards competitive dominance by first showing your top 20 competitors on the SERP for any of the keywords you're tracking. That is, you can see which competitors pose the most serious as well as the most consistent threat to you on the Google SERP. The second phase of this journey takes you to entirely uncharted waters as the SEO Monitor shows you every single change your top competitors have made to their titles, meta-descriptions, and URLs. You'll see every version of the competition's organic results within a 30 day period. What's more is that the tool will tell you where the competition ranked along the way, as well as what SERP features they may have gained or lost. If a competitor has more than one page ranking for a keyword, then you'll be able to see how each of those pages appears on the SERP. By the time you're done, you'll be intimately familiar with the competition's tactics, leaving you in good position to take proactive steps towards a SERP advantage. What the SEO Monitor is to your organic competition, the AdWords Monitor is to your paid competition but all the more so. Where titles and descriptions are often an ad's only content, tracking the changes your competition makes to them is that much more important. Like its sister tool, the AdWords Monitor helps you to identify your top paid competitors per keyword and then takes that knowledge one step further by giving you insight into their very PPC SERP strategy. 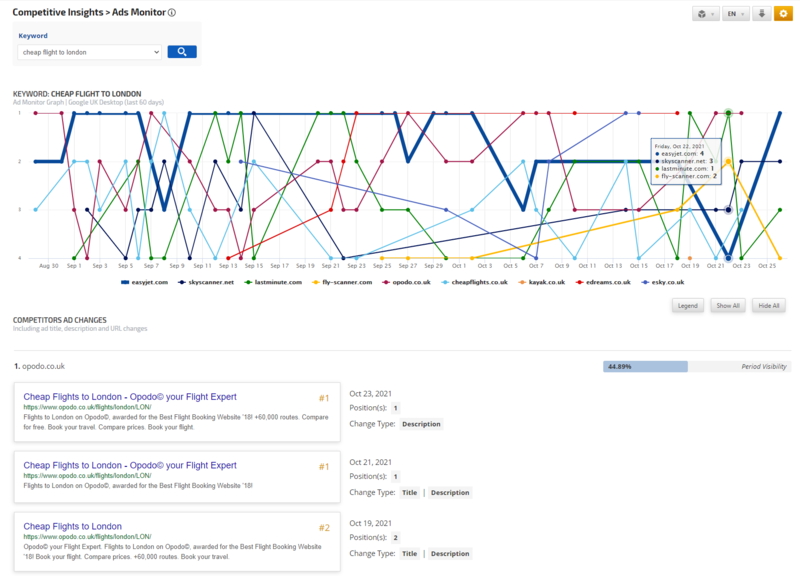 The AdWords Daily Explorer - Carpe Diem! Don't worry, if you're looking for a more global look at your AdWords competition, we didn't forget about you either. 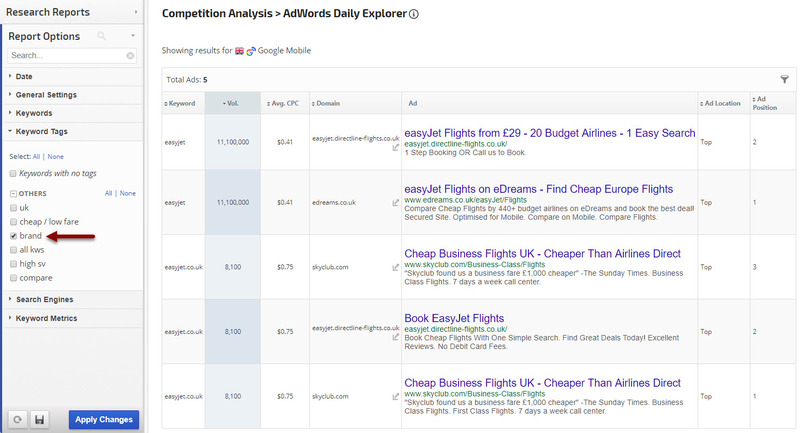 See every ad your competition is running for all of your keywords with the Daily AdWords Explorer. Pinpoint which of your competitors presents the stiffest competition across the board by not only seeing their ad rankings, but their actual ads. Engage the tool's filters/options and set yourself up to discover your toughest mobile competition, analyze local ad campaigns, and prevent brand targeting. As we mentioned earlier, sometimes you even compete with yourself without knowing it, and that's not usually a good thing. To prevent that, we created the Landing Page Monitor. Perfect after a Google update that throws your pages into all new positions, now you can see if more than one of your pages is ranking for the same keyword. This is particularly pertinent if you have a preference as to which page has a more prominent ranking. If one page is lower down on your conversion funnel, it would be quite valuable to know if it ranks significantly above a page higher in the conversion process for a keyword that targets new users. To that extent, the Landing Page Monitor will show you all of your pages that rank on the SERP along with their position so that you can make sure your users see the content you want them to see. Wouldn't you like to know who holds the Featured Snippets for any and all of your keywords? Do we really have to answer that? The Featured Snippet Tool will tell you just that and a lot more. You can use the tool to identify and target Featured Snippets held by competitors that are being pulled from vulnerable rank positions. In fact, you can identify what positions are vulnerable as the tool tells you what percentage of Featured Snippets come from which rank positions across all of your keywords. Featured Snippets are only one of many important SERP features to monitor. In an age where Google's SERP features can make or break a site (think Local Packs for example), it's important to stay in the know. 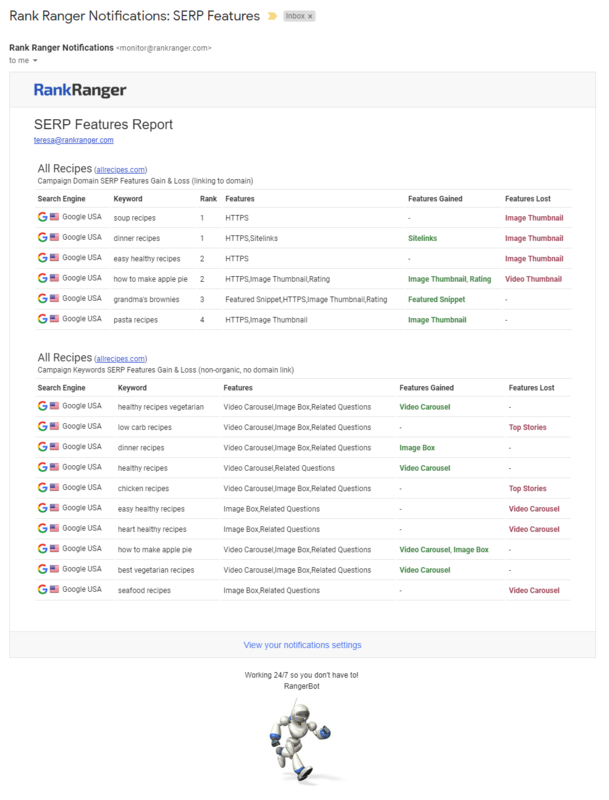 This year we released an automated email report that will tell you when you gain or lose a SERP feature. Simply select which SERP features you want to monitor and how often you want to be updated (i.e., daily, weekly, or monthly) and you're off to the races. 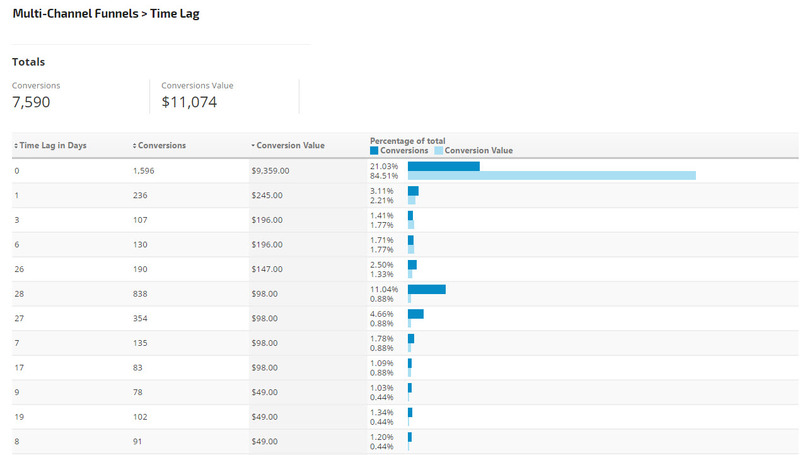 At the same time, you can track the competition's SERP feature gains and losses via our SERP Features Summary that gives you insights into the competitive landscape. Meaning, the day your top competitor loses that Featured Snippet, you'll know, and that is some pretty actionable information right there. This past year we've worked hard to give you the ability to track and monitor uncharted territory. You now have the ability to track rank where no one has tracked rank before. At the same time, we've given you new ways to track, monitor, and analyze some of the data you've long been familiar with. It's like having your cake and eating it too, and everyone loves cake. When Aleyda Solis asked us if we could track the rank of publishers appearing in Google's mobile news carousel (aka Top Stories), we already were! 2017 saw Rank Ranger offer you the ability to easily track rank within the mobile Top Stories carousel. Now you can know if a publisher is appearing in the 1st or 15th card of the carousel. In addition, you can access the full results shown within a mobile news carousel on a daily basis with the Rank Tracker's SERP Snapshot feature! In yet another Rank Ranger exclusive into uncharted ranking territory, 2017 gave you the ability to track rank within Google for Jobs. Google's new jobs feature is a behemoth of aggregated job listings that outshines the organic results. As the feature only gains elements and increased prominence, tracking rank within it becomes more and more relevant and essential. 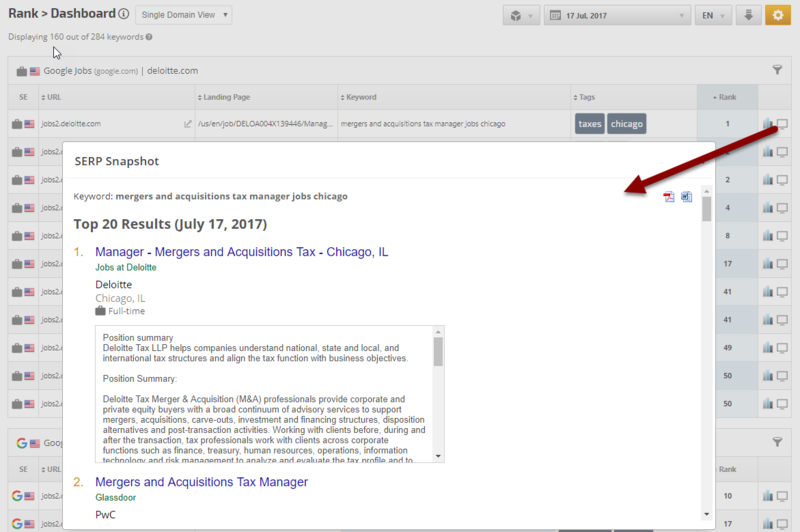 Now you can not only track rank within the SERP feature, but gain access to the competition's actual job postings placed within Google for Jobs! Google's App Box on the mobile SERP is one of the most prominent places developers can utilize to showcase their apps. 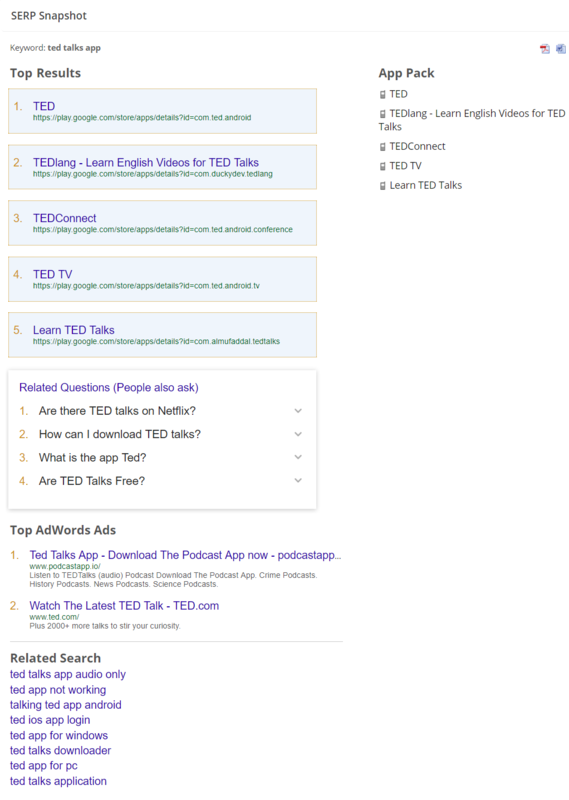 Unexpanded, this mobile SERP feature can contain up to six apps. Once expanded, users may have over 90 apps to scroll through! Tracking rank here is obviously paramount and Rank Ranger is now the only place you can! Not only did we give you new venues to track rank for, but in 2017 we also gave you new ways to report your rankings. Designed for enterprise level customers, in 2017 we rolled-out the Quarterly Rank Report. The report, by offering quarterly rank comparisons, was designed to be a vehicle that syncs what you're doing within your SEO campaigns and the overall performance analysis undertaken in the boardroom. By utilizing traditional business time-frames, showcasing the impact and significance of your progress is that much easier and relatable. We can't say enough about how important tracking your entire conversion process is. That's why we overhauled the way you can monitor and analyze a user's path towards conversion. The Multi-Channel Funnels Report presents you with a multi-layered way of analyzing the path towards conversion. Use the report to determine a channel's true value by analyzing its role in assisting conversions, track how long the conversion process takes, identify the top path towards conversion, and isolate the number of interactions users undertook before converting. Being an all-in-one SEO and digital marketing platform is more than a slogan to us. That's why we're intent on making sure you have access to a wide array of data. In 2017 we made sure to give you more data options than ever for even deeper insights and broader comparisons. Perhaps no other integration portrays our dedication to offering you a purely custom experience than our Google Sheets integration. Offering a truly unique ability to paint a full data picture, our Google Sheets integration enables you to place your own internal data alongside that found within Rank Ranger. The result is comprehensive data reporting that accounts for any and all aspects of your marketing efforts. Over the past year or so, Bing has made numerous changes to its PPC ads and ad management platform in their ongoing effort to eat away at Google AdWords' hegemony. As PPC managers increasingly make use of Bing Ads, we made executing a deep cross-platform PPC analysis easy by integrating Bing Ads into Rank Ranger. Now, via our Insight Graph and Metric Widgets, you can easily track and compare your AdWords performance to your Bing PPC results. 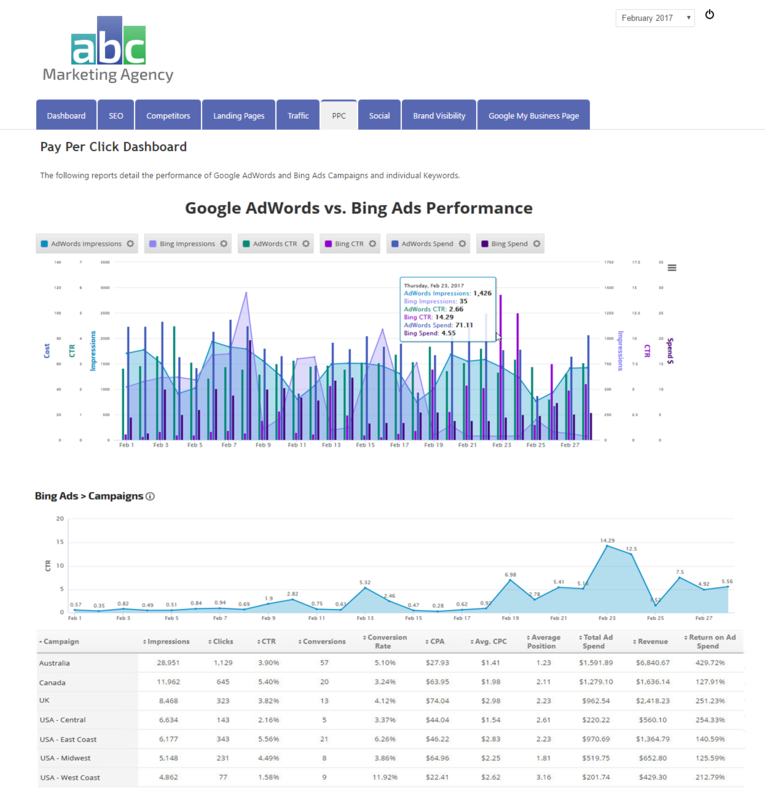 Beyond creating custom PPC graphs, you can place your comparative data within our 100% white label Marketing Dashboard. We rounded off our Google integrations for the year by offering access to Google Audience Interests via Rank Ranger. Helping you make more informed decisions, the Audience Interest reports found in Rank Ranger utilizes the data from your Google Analytics account to provide you with a breakdown of user interests by category. 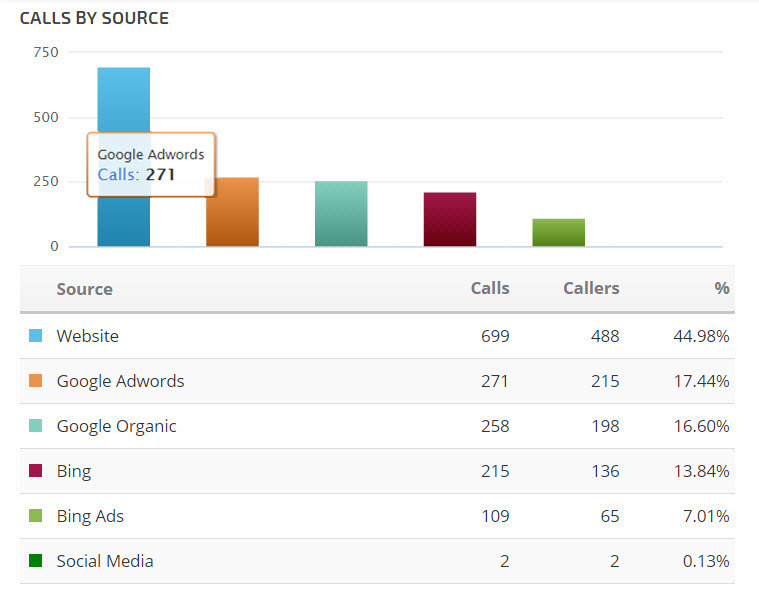 The report also shows you how users within these interest categories interacted with your site. The more options, the better. At least that was our thinking when it came to offering call tracking and email marketing integrations. Indeed we started the year off by integrating Call Tracking Metrics in January of 2017. 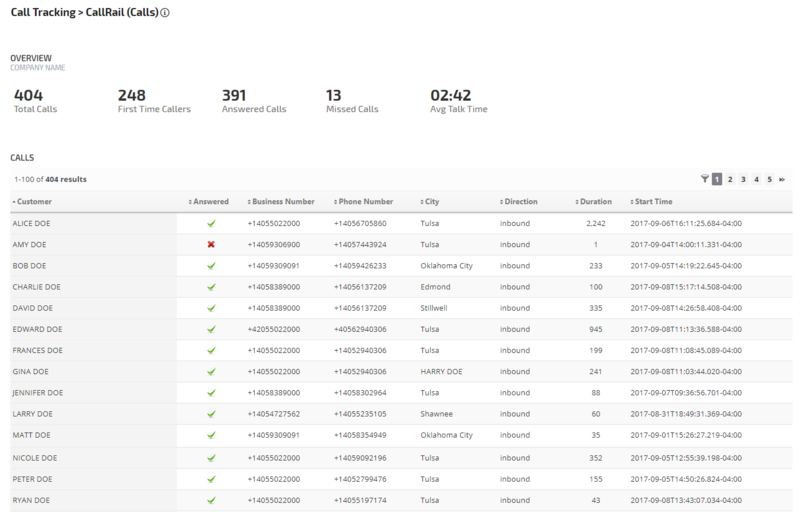 Determined to offer you more than one call tracking option, we then integrated CallRail data into Rank Ranger this past September. We did the same when it came to email marketing integrations. Our second integration of the year was when MailChimp came to Rank Ranger. Interestingly enough, we ended the year by placing both Constant Contact and AWeber data inside our software, making Rank Ranger an all-in-one email marketing suite. 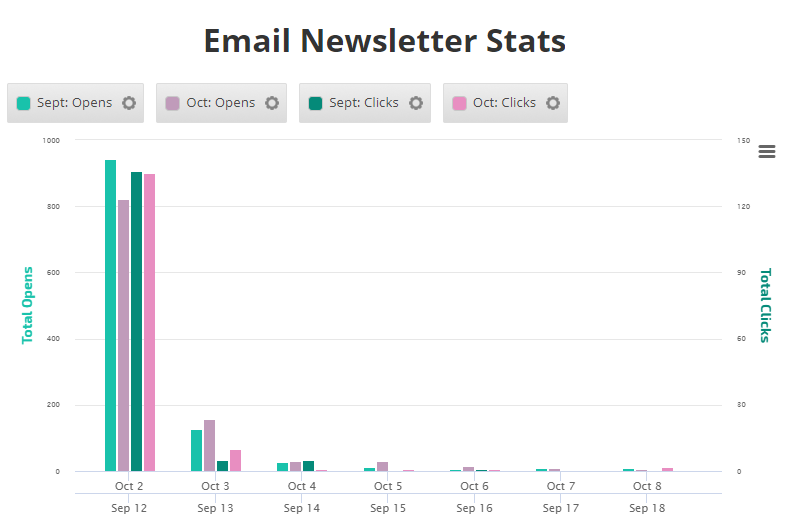 At a minimum no one can say that we aren't providing enough automated email marketing options! Of course, any of the call tracking and email marketing data found inside Rank Ranger can be placed within our various white label reporting options. 2017 was one of the most dynamic years we've had in so many ways. We can't tell you how much we appreciate the feedback we've gotten from our customers over the year and the partnerships we've made as well. Knowing that all of the hard work we put into developing the latest and greatest in SEO and marketing reporting actually makes a difference to our customers means everything to us. Which is why our team is already hard at work to blow you away with all new capabilities in 2018! We have a lot of big plans already in the works for the upcoming year. In fact, we're set (and excited) to bring you site audits in early 2018 as we've joined forces with DeepCrawl, the leading online site audit tool! You can be sure there will be quite a few integrations accompanying it as well! Now, besides for all of the other reports and tools coming your way in 2018, we're working on something truly special. We're not going to say too much about it now, but if you're tracking job related keywords in any way at all, this one's for you! You've never seen anything like it, we guarantee it! But of course, we want to know what SEO and digital marketing reports and tools you want! As we always end off our year in review posts, we would love to hear from you! Let us know what tools, reports, or features would help you! Dying to have a piece of data in an SEO report? Just reach out to us and we'll work our magic on your behalf!